Delta Force was formed in 1977 by the legendary Special Forces commando Colonel Charles "Chargin' Charlie" Beckwith in response to numerous, well-publicized terrorist incidents that occurred in the 1970s. The unit was modeled after the British SAS (Special Air Service) one of the most elite special forces units in the world. Delta Force is a counter-terrorist unit specializing in hostage rescue and reconnaissance, and they are equipped with the most advanced weaponry and equipment available in the U.S. special operations arsenal. Delta Force "operators" are recruited from the U.S. Army; mainly from the Green Berets and Rangers. The exact composition and strength of Delta Force are closely guarded secrets. For many years the existence of Delta Force was officially denied, though it was known that the unit took part in the failed attempt to rescue American hostages in Iran in 1979. Delta Force conducted successful hostage rescue operations during the invasions of Granada (1983) and Panama (1989). 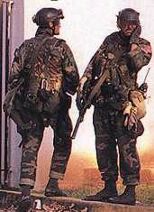 Delta Force participated in the first Iraq war (1991), although the full extent of what they did there has not been revealed. Delta operators provided security for senior US officers and officials including General Norman Schwartzkopf and took part in the hunt for Scud missile launchers inside Iraq. In 1994, UN relief efforts in Somalia were being hampered by local warlords. UN troops were sent to protect the humanitarian workers and after a group of Pakistani troops were ambushed and killed the decision was made to capture the most powerful warlord, General Mohammed Farrah Adid. Army Rangers and Delta Force launched a mission to capture Adid and several of his lieutenants, but during the mission two support helicopters were shot down. The mission was immediately changed to rescue the crews from the downed choppers. Two Delta snipers circling above in a helicopter volunteered to defend one of the crash sites that was about to be overrun by Somali gunman. They knew it was probably a suicide mission but they agreed to be dropped off at the crash site because they could see that at least one of the American soldiers there was still alive. They held off hundreds of Somali gunmen until they were overrun and killed. They saved the life of the chopper pilot, Michael Durant who was captured by the gunmen and later released. Master Sergeant Gary Ivan Gordon and Sergeant First Class Randall D. Shughart were awarded the Medal of Honor posthumously for their extraordinary heroism. By the time the Rangers and Delta Force operators arrived at the crash areas and set up defensive perimeters, they were surrounded by hostile natives and under near constant attack. They were trapped in the city overnight and suffered heavy causalities, but the next morning a relief force arrived led by the 10th Infantry Division and they fought their way out along what became known as the Mogadishu Mile. Prior to the war in Afghanistan in 2002, Delta operators were sent to the major cities and contested areas in the north for reconnaissance purposes. During and after the war, Delta Force searched for the leaders of the Taliban and Al Quaeda, including Mullah Omar and Osama Bin Laden. Just prior to second Iraq war in early 2003, Delta Force operators entered Baghdad and established a network of informants, while also eavesdropping and sabotaging Iraqi communications lines. During the invasion, Delta operators searched for senior Iraqi officials and weapons of mass destruction (WMD). After the capture of Baghdad airport, Delta Force set up a secret "Battlefield Interrogation Facility" for insurgents and suspected terrorists, and is now under investigation by the Pentagon Inspector General’s Office for allegations of torture and other prisoner abuses at that facility. One of the more interesting components of Delta Force is called the "Funny Platoon." This unit consists entirely of women who can be used in situations where a woman operating alone would arouse less suspicion. They receive additional training in the use of disguises and concealable small arms.